Sweden, which finished atop the round-robin standings at 11-1, will play in Sunday’s gold-medal game of the Pioneer Hi-Bred World Men’s Curling Championship, presented by Service Experts, Heating, Air Conditioning and Plumbing against the winner of this evening’s other semifinal at 7 p.m. MT between Kevin Koe of Canada, who beat Bruce Mouat of Scotland in the morning qualification, and Peter de Cruz of Switzerland. “That was a pretty clinical performance,” Edin said of his victory. “We talked about the details going into this game. We played really solid all week … so we just wanted to improve on the small details and I think we got almost all of those together. Edin, third Oskar Eriksson, second Rasmus Wranå, lead Christoffer Sundgren, alternate Daniel Magnusson and coach Fredrik Lindberg, scored two in the first end on Edin’s last-rock tap back. 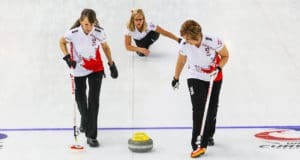 They took control of the game with three in the fourth after a costly half-shot on a hit-and-stick by Japan that left Edin a raise rap back that he executed to perfection. Matsumura, third Tetsuro Shimizu, second Yasumasa Tanida, lead Shinya Abe, alternate Kosuke Aita and coach Bob Ursel, were forced to take singles in the second and sixth ends. Edin immediately responded with two in the seventh with a gentle last-rock tapback of Japan’s counter at the back of the four-foot. 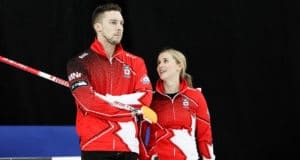 Edin, looking to tie Canadian Ernie Richardson as the only skips to win four world titles, was as sharp as he’s been all week, shooting an impressive 95 per cent in the game. In the eighth, with Japan trying for two to get back into the game, Edin made a tight double to shot rock and ended up with a steal of one that prompted Japan to shake hands. Japan will play the loser of the Canada-Switzerland semifinal in the bronze-medal game Sunday at noon. 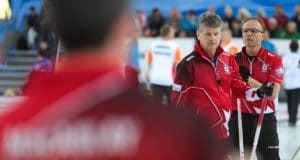 The 2019 Pioneer Hi-Bred World Men’s Curling Championship continues Sunday with the bronze-medal game at noon and the gold-medal game at 5 p.m.
TSN and RDS2 will provide complete coverage of the 2019 Pioneer Hi-Bred World Men’s Curling Championship. CLICK HERE for the complete schedule.